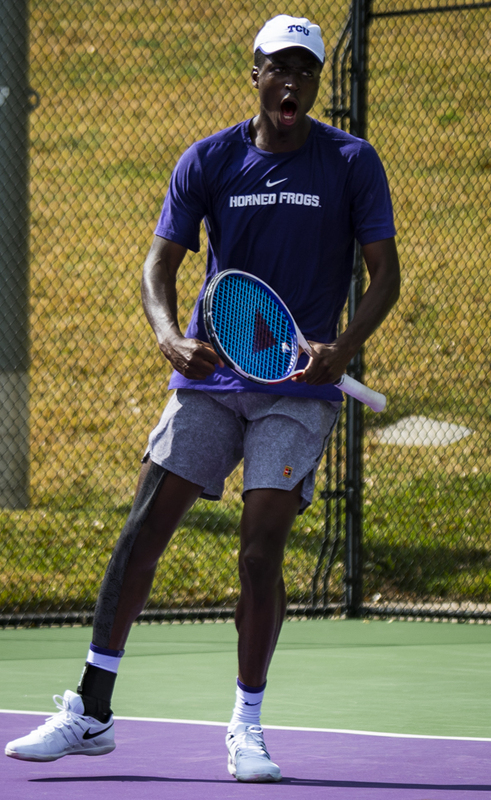 TCU men’s tennis won a close match Sunday, defeating the Arizona State Sun Devils 4-3. The match was close throughout, with the Frogs getting swept in doubles but taking the No. 1, 2 and 4 wins in singles. “What made today even better is that we lost the doubles point, and these guys, they keep finding ways to get to four points,” head coach David Roditi said. First-year Luc Fomba had his biggest match of his career, winning 6-4, 4-6, 6-2 to clinch the victory for the Frogs. TCU’s doubles point had been their strong point heading into Sunday, with the Frogs having won it in all of their last eight matches. The last time TCU lost the doubles point and won the match was a 4-1 win over No. 3 Mississippi State in mid-February. This is the first time this season that the Frogs were swept in doubles and won the match overall. The No. 2 doubles team of Alastair Gray and Alex Rybakov fell 6-4, followed by a 7-5 loss of the Fomba/Sander Jong team. The No. 6 nationally-ranked Bertus Kruger/Reese Stalder team was tied at six games a piece when the contest was called. The loss moves TCU to a 12-5 doubles point record on the season. Heading into singles, the Horned Frogs had to post strong scores to have a hope of winning the match. They won five of their first six sets. In the second set, every Frog except for Rybakov and Jong fell, tying every match except one heading into the third set. Rybakov was the lone Frog to be up 2-0, something that helped propel the team to victory. “Rybakov keeps being tough in really tough moments,” Roditi said. After a rocky start, Stalder had a great run in the third set before running out of gas and giving the Sun Devils the lead back. This loss snaps a six-match win streak for the senior. Gray battled back after a dominant first and disappointing second set, bringing back the score to a draw 2-2. This extends Gray’s winning streak to seven. Kruger’s up and down match finished with a tight 6-4 win in the third set, bringing TCU to their first lead of the day, 3-2. Immediately following the Kruger win, Jong failed to put away the Sun Devils, leaving the match up to Fomba at court five. In the final match of the day, Fomba came through for the Frogs, finishing off his opponent to secure the team’s victory. Fomba is now riding a five-match win streak and hopes to continue it into the SMU match this week. TCU hosts metroplex rivals SMU at 5:30 p.m. Tuesday and travels to Waco to face No. 6 Baylor Friday.